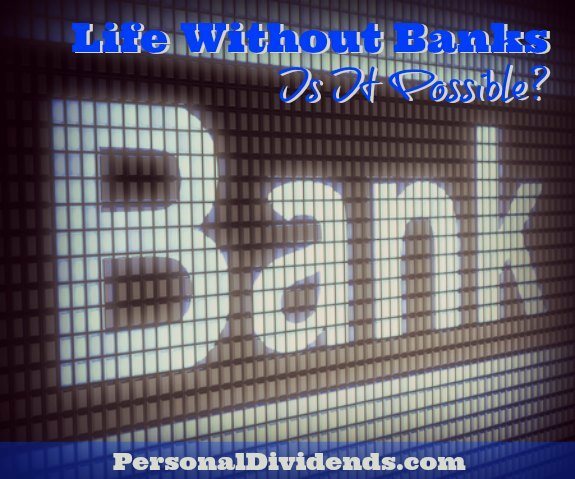 Life Without Banks, Is It Possible? I don’t really use banks in the same way my parents did. It is conceivable that I could get along just fine without one. Many people do. What would it be like to completely ditch the bank? How would it change the way we transact business. Would it be a huge imposition, or would we even notice the change? It is important to take this disclaimer seriously. What follows is not investment advice, but a consideration of possibilities. Before closing out your account, let’s see what the possibilities are. Where will your money live? I honestly don’t know the answer to this question. It is not just about where your money is parked, but having it in a useful form. If you are going to pay for things where cash is not a good option, then you need something like a bank for your money. You can always try a credit union. I hesitate to mention it because a credit union is so much like a bank, it feels like cheating to even bring it up. There are a few differences, but not enough for my purposes. In the spirit of this tech-forward age, bitcoin is another alternative. But bitcoin is less an alternative to banking, and more an alternative to money. It is a little like investing in gold, except without the intrinsic value. Oh, and good luck trying to pay for your Cream of Mushroom soup with bitcoin. Where do you borrow money? This one is a lot easier to deal with. There was a time in this country when the local bank was the only place to borrow money. When it comes right down to it, money lending is the primary reason banks exist. But there are generations of people who never borrowed money from a bank. Technically, student loans are bank loans guaranteed by the government. Those are still bank loans, though that is not always obvious to the borrower. As for big-ticket items like automobiles and houses, you wouldn’t want to put those on credit cards, not that you could in most cases. But there are many lending institutions that will be very happy to set you up with financing before you ever leave the dealership. You can even buy a house without a bank account Peer-to-peer lenders can help you get smaller loans for home improvements and other necessities. Where will you invest your money? One of the reasons banks were pushed as the place to keep one’s money is that certain types of accounts earned interest. Keeping your money in the bank was a guaranteed way of increasing your fortune. But in the real world, you just don’t earn a lot of interest with a typical checking or savings account. There is a good chance your monthly and annual fees erase any interest you may have received. If you have a lot of money, it shouldn’t be sitting in a typical checking or savings account anyways. For that, you are looking at investment options like CDs and bonds. But you don’t need a bank for these investment options. In fact, there may be good reason to avoid banks if you are looking for a return on investment. There is no end to firms that will gladly help you invest your money. For a good return on investment with a little more risk, almost any of them are a better choice than your bank. If you are thinking about moving to a bank alternative, don’t let investments be the thing that stops you. I repeat, don’t take any of this as financial advice. It is more along the lines of a thought experiment. Leave the real financial advice to the experts. Websites such as Bloomberg, BankingSense, or The Motley Fool are a great option if you are looking for more in-depth advice and information about the financial world on a continually updating basis. I know plenty of people who live just fine without a bank account. They don’t write checks, or use credit cards, or borrow money. As for me, a debit card, a place to store my money, and a way to pay my bills pretty much takes care of my needs. But all of those services are offered by banks. You can certainly find alternatives. But you would have to have a very good reason to do so. I don’t, and I don’t know anyone who does. So while you can live without a bank, I have yet to encounter a good reason why anyone should.